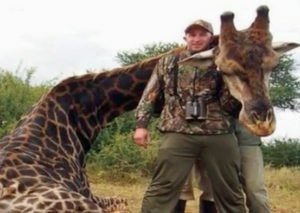 Author Justamis2015Posted on May 28, 2017 Categories Animals in the NewsLeave a comment on Big Game Hunter Kills This Gorgeous Animal – See What Mother Nature Had Her Soldiers Do! 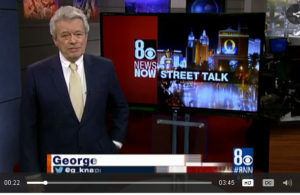 Watch What Award Winning Investigative Reporter, George Knapp, Has to Say About The Safari Club’s Convention in His City, Las Vegas! Author Justamis2015Posted on May 27, 2017 Categories Animals in the NewsLeave a comment on Watch What Award Winning Investigative Reporter, George Knapp, Has to Say About The Safari Club’s Convention in His City, Las Vegas! Register On My Website and See What You Get! Welcome To Animal Instincts Publications! My job is to spread Animal Awareness. Your job, should you choose to accept it, is to continue the message! Or Click the Cover of the Book! Your Monthly Animal Instincts Poem! Remember to click on the “Subscribe to List” button below. 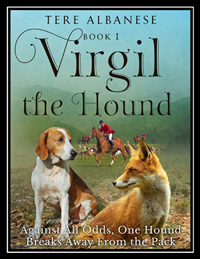 Author Justamis2015Posted on May 11, 2017 May 17, 2017 Categories Animals in the NewsLeave a comment on Register On My Website and See What You Get! Here is this week’s Face of Animal Cruelty – Meet Aurora. UPDATE 5-8-17 – Aurora is just starting to heal. She has gained a bit of weight (is up to 15.5 lbs now) and this morning she was sedated and had her wounds cleaned up before her bi-daily burn ointment application. 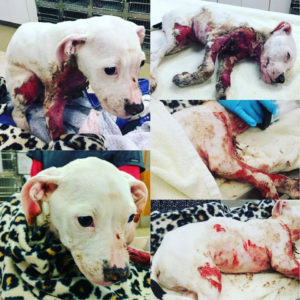 With regards to the investigation, Aurora was brought to HSGKC by KCK Animal Services as a stray and the KCKPD detective has now concluded that the initial report was incorrect and that Aurora’s injuries were the result of an accidental cooking grease incident. Rescuer’s focus remains on Aurora’s recovery, making sure she heals, and eventually makes her way to a loving home. This is the worst burn case we have ever seen. Where do I begin? 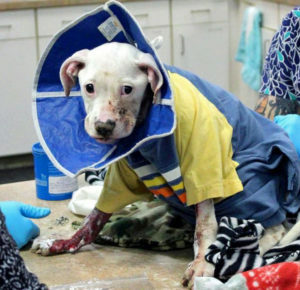 The Humane Society of Greater Kansas City sent out a plea to help a tiny pit bull who had been badly burned. A woman called animal control and stated there was a stray dog in her front yard that had been set on fire. The dog, now named Aurora, was brought in with 2nd and 3rd degree burns covering almost half of her body. We have partnered with HSGKC to raise the funds needed to save Aurora’s life. But we need your help. Here is where the story gets complicated. After the police started an investigation into the case, the woman who called Animal Services came forward as Aurora’s actual owner. She had made up the story about the dog being a stray in order to get the dog help. She then stated that the dog accidentally knocked over cooking oil that fell on Aurora, burning half her body. She said the accident happened 5 days before she called. I can’t even imagine how painful that must have been for little Aurora! The care she needs to survive is extensive. Burns like these take months of around-the-clock care. That is where we need your help. We have created these animal saving shirts, bracelets and totes to help us raise the funds to cover the costs of her extensive surgeries, skin grafts and emergency care. We have partnered with The Humane Society of Greater Kansas City to raise the donations needed to save Aurora’s life. Together, we have created the animal-saving shirts, sweaters and totes to raise the funds needed. Purchase yours today. We made a promise to Aurora and her nonprofit that we will not stop until she is safe and pain free but we cannot do that without you! Author Justamis2015Posted on May 10, 2017 May 19, 2017 Categories Animals in the NewsLeave a comment on Here is this week’s Face of Animal Cruelty – Meet Aurora.